Remember that movie? I must have watched it a dozen times. Every time I look at a magnolia tree I think of this movie. I have three 30-ish feet magnolia trees on my property and have never used the leaves! Can you believe it? They are so beautiful and very tough, so they make great leaves for decorating. 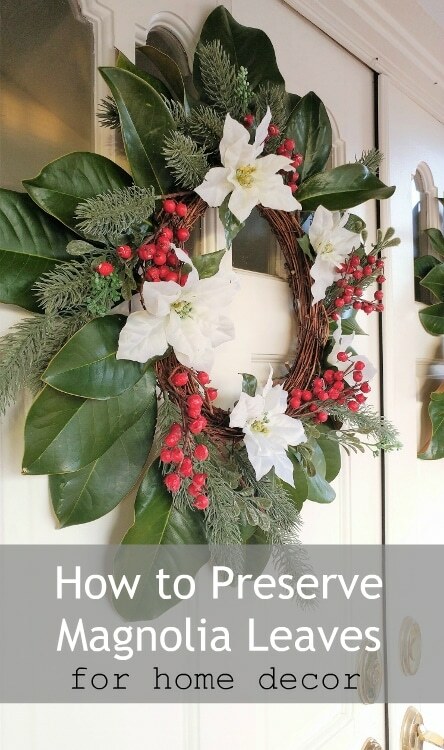 I decided to use them in my Christmas decor this year so I thought I’d share how to preserve them, so they last longer. I have read several articles that this method works, but to be honest I am trying it out for the first time. As a test, I kept a leaf to the side that I did not cover with Mod Podge to test the difference. This materials list includes affiliate links for recommended products. Time for this project depends on how many leaves you need. Remove the leaves from the tree and rinse them with water. Dry them off with a clean towel or paper towels. Allow them to air dry completely. If you apply Mod Podge to wet or damp leaves, it will appear white or faded after a week or two. Spread out newspaper or packing paper to protect your work surface. Paint the front of the leaf with Mod Podge using a foam paint brush. Be very liberal with the Mod Podge and make sure you cover the entire area including the stem. Any uncovered area will still turn brown. I used Mod Podge with the Matte finish, but you can use the glossy finish if you like. I found that using the matte finish keeps the leaves looking natural and shiny. Cover the middle, sides, and stem. Allow them to dry. Turn them over and paint the back. Again, be very liberal with the Mod Podge ensuring that the entire leaf is covered. Allow them to dry. REPEAT three more times. Use them for your décor! I used them for embellishing my grapevine wreaths as well as decorating the garland for my mantel and front door. 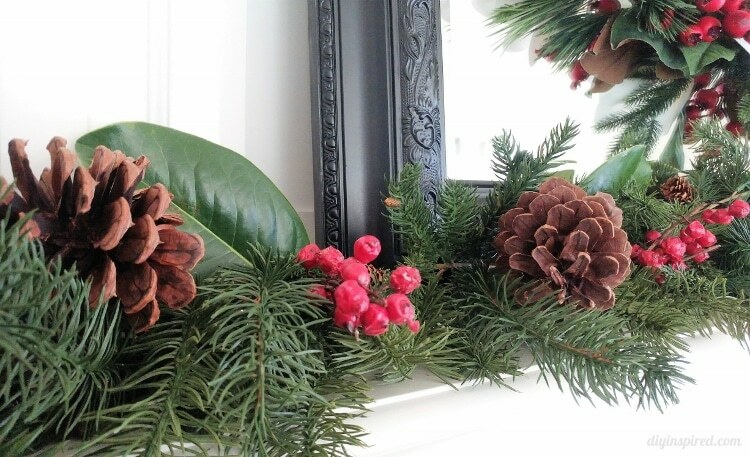 Tip: Use floral wire or garland wire to attach the leaves to your wreaths or garland. You can buy a pack of garland wire at the 99 Cent Store. 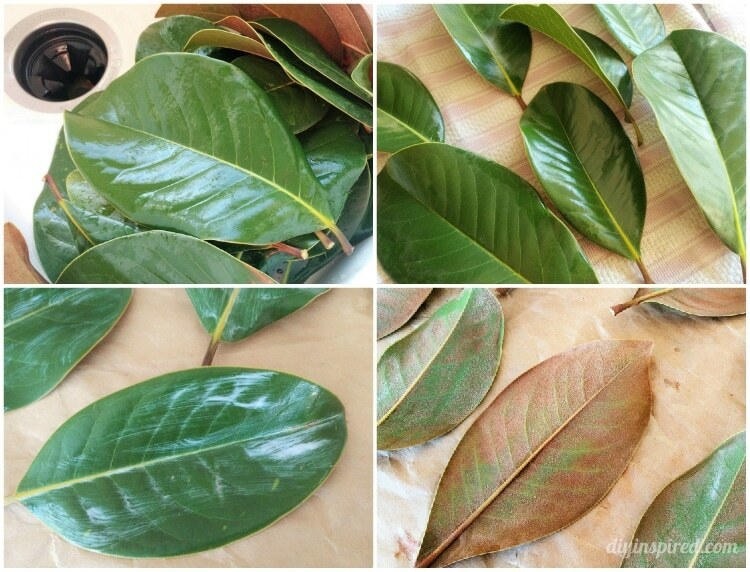 Without using Mod Podge, magnolia leaves will slowly dry out in about 4-6 weeks. I will keep you posted on the status of this method and how much longer the leaves will last. Important: Be sure to keep the leaves out of direct sunlight as well. You can also use the glycerin method. This takes longer to do than using Mod Podge. For this you mix one part glycerin with 2 parts hot water. Submerge the leaves in the solution for three to four days. Allow them to dry. Love magnolia wreaths!! How long did the leaves last with the mod podge method? Do they last any longer with the glycerin method? Hi Angela! They are about the same. The mistake though that I made with some of the Mod Podge leaves is that I did not let some of them dry completely after rinsing all the debris off. So, just make sure they are. It takes some time. Sorry if you mentioned, how long did the color last with both methods? Thinking about using some for a diy wedding project and I’d like to know when to get started. If you are using them for a wedding, to be safe I would do it no more than 2 weeks prior. I say this because you have to make sure the leaves are COMPLETELY dry before applying the Mod Podge, or you will get some brown spots after about 2-3 weeks. If you do everything correctly, how long do the leaves look good? Hi Carol! This wreath lasted several weeks! I did make a mistake on a few of the leaves, though (I didn’t let them dry thoroughly). So, I removed the brown ones, and spread the rest apart and it still looked great. If you do take precautions and make sure they are thoroughly dried before applying the MOD Podge, how long will they stay a green color? I used glycerin and water with green food coloring a few weeks ago and although I feel they are in the process of being preserved (I will give them another week or so, not in a rush to use them) the leaves all turned brown, although pretty, I wanted them green! Before my husband cuts this tree down, (it was seeded by a bird dropping and is a wild magnolia that grew way to fast and taking over the garden) I will cut more off and MOD PODGE, if they stay green color and mi the 2 together! Hi Carol! Mine did stay green (other than the ones I mentioned that I didn’t dry all the way) to the point when I ended up discarding them several weeks later. I do love the brown leaves too. Maybe you can coat it with something… clear acrylic glaze? Did the Mod Podge make them last longer than. Or doing anything at all? Thanks! Hi Shannon! My mistake on some of the leaves was rushing and not allowing them to dry completely before I applied the Mod Podge. But on the ones that were dry, they lasted quite a long time. Hi there, how long did the leaves last that did not get mod podged? Hi Meredith! They still lasted a few weeks without the Mod Podge, browning a little but still looked decent. I found trying to preserve these leaves are a waste of time and expense. 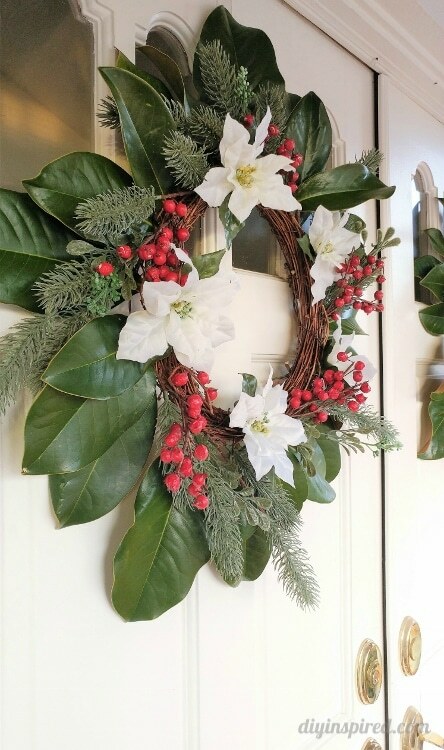 Simply attach fresh leaves to wreath. The will still turn brown and get very brittle same as if the were not dried.